Fiction – hardcover; Grove Press; 336 pages; 2007. 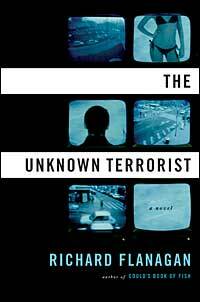 Australian author Richard Flanagan‘s latest novel, The Unknown Terrorist, is dedicated to David Hicks, the Australian-born Taleban fighter captured by US forces in Afghanistan in November 2001. Hicks was detained by the US Government in the Guantanamo Bay detention camp for more than five years, before he was tried and convicted of supporting terrorism in 2007. His ongoing detention without trial made him a cause célèbre in Australia. If nothing else, this particular case highlights that those accused of terrorism are not subject to the normal “rules” under the justice system as it operates in most democratic countries: if you are in the wrong place at the wrong time you could be locked away without trial and, what’s more, you could be mistreated and tortured on the simple basis that you are presumed guilty with no legal right to defend yourself. Since the advent of 9/11 and the subsequent War on Terror, we live in dangerous times, but who is in danger? Innocent civilians who may be blown up at any moment? Or innocent people accused of plotting to blow things up on the flimsiest of “evidence”? It’s a blurry line and it is exactly this line that Flanagan exploits for the purposes of this thrilling, thoroughly modern novel. Set in Sydney across five hot, summer days, the story follows Gina Davies, a lap dancer known as the Doll, on the run from the law having been accused of helping to plot a terrorist attack. But Gina is entirely innocent. Her “crime” has been no more than having a one-night stand with an attractive stranger, Tariq, who is blamed for three unexploded bombs found at Homebush Olympic Stadium the previous day. Broadcast journalist come television celebrity Richard Cody — whom I suspect is a thinly veiled version of Ray Martin — is onto the story straight away for a prime time current affairs program called Undercurrent. Cody has had a secret “encounter” with the Doll at the club and thinks there’s something mysterious about her. What ensues is a media beat-up about the “unknown terrorist” that becomes increasingly fantastic as time goes on, with little grounding in reality. But despite Cody’s occasional twinges of guilt — he realises the Doll has no motive for the crime — he justifies his decision to “move the story on” because ASIO spook Siv Harmsen tells him that “we need stories that remind people of what horrifying things might happen”. And so standing together they watched the same footage run again — the same bomb in the same kid’s backpack; the same bad photograph of the same bearded man in Arabic-looking dress; the same slow-motion grainy images of Tariq and the Doll hugging each other. The repetitive images clicking over filled the TV like loose change filling an empty poke. The Twin Towers fell again; the same children’s bodies were laid out once more in Beslan; the same man or woman dressed in black brandished the same machine gun; the Doll continued dancing naked. And there were new scenes — a murky London tube train moments after it had been bombed; the Sari nightclub burning after the Bali bombing; wounded being taken away from the Madrid train bombing, the montage culminating in a shot that zoomed in on the Sydney Opera House before being blowing out to white, a cheap effect accompanied by an ominous rumble. The Doll closed her eyes. When she opened them she saw Osama bin Laden. George W. Bush. Missiles being launched. Men in robes firing grenade launchers. Great buildings exploding into balloons of fire. Women covered in blood. Hostages about to be beheaded. New York! Bali! Madrid! London! Baghdad! The Doll disintigrating into dancing squares of colour, herself pixellated, smiling a smile that was never hers. Without wishing to spoil the plot, Gina’s life — and that of her best friend, Wilder — is put in increasing danger until the dramatic, heart-thumping climax. This is a genuinely intelligent thriller, quite unlike anything Flanagan has written before but with the same beautifully written prose for which he is renowned. I love the ways in which he uses analogies and similes to bring his writing to life. The book is littered with hundreds of examples, but this one, in which he compares a policeman’s dying marriage to that of a dying tree, demonstrates his particular brand of originality. They stayed together and watched each other slowly become strangers, watched their love die as you watch a great old gum tree succumb to dieback. The affair was over for him, but it was just beginning for her. She never found out then, but it was as if each day now she lived another day of those years of lies and deceit; and his punishment was to witness her suffering. First just the leaf tips in the distant crown brown a little at the edges, then whole leaves, then a branch here and there. Still the tree lives, and everyone says it will be fine, that it is the weather, or one of those things, or anything but the death of something as natural and as seemingly permanent as a tree. But when his marriage began dying back, Nick Loukakis discovered nothing is fine. Each day some small thing — a joke, a shared intimacy, a sweet memory — he found to have withered and died. Caresses fell like dead leaves. Conversations cracked and then broke. And in the end there was nothing to quicken the trunk with the rising sap that fed and was fed in return by the branches, by the twigs, by the leaves. And in the end what remained, Nick Loukakis discovered, was nothing; nothing to keep it going, just a large thing still standing erect and proud, only everything about it had withered and died. This is a very knowing novel, carefully constructed to expose the kinds of puppetry that goes on behind the scary headlines and news bulletins that bombard us on a daily basis. As well as dropping cynical observations about media manipulation, The Unknown Terrorist also takes a pop at the politics of fear mongering. It’s by no means a perfect novel — there are far too many coincidences throughout, and the entire plot is far too contrived — but it’s a genuinely exciting and thought-provoking read about the shallow yet dark times in which we live. Sounds interesting, Kim. I’ve added it to my want-to-read list. Christina, it’s a great read — and so different to anything else his written. I like that he’s not afraid to experiment with genres and to stretch himself as a writer. Just a quickie, but Hicks agreed to a plea bargain, he was never tried, and therefore wasn’t found quilty. This is even more ridiculous when you consider that the charges “supporting terrorism” did not exist at the time of his arrest. Andi, thanks for the link. The book does sound like it is worth reading. The UK is undergoing the same kinds of changes to “democracy” — we are apparently the most surveiled population on earth, with CCTV cameras on every street corner etc. Civil liberties are being constantly chipped away at without people realising the consequences. Caerd, thanks for your comment. Regardless of the plea bargain, Hicks was still convicted — for “providing material support for terrorism” — and given a jail sentence. But, surely there would need to be a trial in a legally recognised and constituted court, rather than the Gitmo Kangaroo Courts? My comment hinges more on the notion of guilt I guess. What actually did Hicks do? Some great possibilities here. I want to put forth “Some Kind of Angel,” a post-9/11/ thriller with a terrorist threatening the world with weapons of mass destruction. This terrorist is home-grown, not imported, and he’s got an interestingly twisted mind. Our heroes are a young forensic doctor and an older investigative reporter, who must destroy the terrorist and save the world. The new characters — they’re refreshingly different, too — drive the plot, which is quite fast-paced.